Wyatt Earp is a 1994 American biographical Western film directed, produced, and co-written by Lawrence Kasdan, with Dan Gordon. It stars Kevin Costner in the title role as the lawman of the same name, and features an ensemble cast that includes Gene Hackman, Mark Harmon, Michael Madsen, Bill Pullman, Dennis Quaid, Isabella Rossellini, Tom Sizemore, JoBeth Williams, Mare Winningham and Jim Caviezel in one of his earliest roles. The film received mixed reviews and was a box office bomb. A teenaged Wyatt Earp lives on the family farm. His older brothers, Virgil and James, are away at war serving with the Union Army. Wyatt dreams of war, and packs some belongings, bids his younger brothers and sisters goodbye, and attempts to run away, intending to lie about his age and join the Union Army. He does not make it off the farm before his father catches him and forces him to return home. A short while later, both brothers return home at the war's end, with James gravely wounded. Shortly afterwards, the family moves west. During this move, Wyatt first sees a man killed, shot during a gunfight. He gets sick at the sight, and vomits. Years pass, finding him working out west as a wagon driver. During his time there, he works also as a referee for fights, and finds himself at odds with a bully. Wyatt and the bully eventually come to the point of fighting, with the bully intending to shoot Wyatt. Wyatt disarms him and defeats him, taking his gun as a trophy. Returning home to Missouri, Wyatt marries a childhood sweetheart, Urilla Sutherland. The two move into their own house, and he begins working as a policeman. Months later, while pregnant, his wife dies from typhoid fever. He stays by her side throughout the illness, becoming deeply depressed afterward. He burns their home and all they own, and begins drinking and drifting from town to town, eventually landing in Pine Bluff, Arkansas. He robs a man and steals his horse, but is captured a short time later. With Wyatt facing certain hanging, his father bails him out of jail, telling him to leave and never return to Arkansas. He begins working as a buffalo hunter, where he meets Bat Masterson and his brother Ed Masterson. The three become friends and work together hunting buffalo, with the two brothers working as Wyatt's skinners. Years pass, and he begins working as a deputy marshal in Wichita, Kansas, and builds a reputation as a good lawman. He is recruited to work as a deputy in Dodge City, with a lower salary, but for extra money for each arrest made, in the end making more than he would have in Wichita. In Dodge City, he builds a hard reputation, and he kills his first man, a shooting witnessed by actress Josie Marcus. Wyatt becomes involved romantically with a prostitute, Mattie Blaylock, and the Mastersons begin working with him as deputies. Wyatt disagrees with Ed Masterson working as a lawman, believing him to be too passive. However, the Dodge City council decides that Ed is more acceptable than Wyatt due to the latter's excessive force, and fires him, appointing Ed to take his place. Wyatt then begins working for the railroad, capturing outlaws. While pursuing outlaw Dave Rudabaugh, he is introduced to gunman and gambler Doc Holliday, in Fort Griffin, Texas, and the two become friends. Holliday assists Earp in locating Rudabaugh, whom he dislikes tremendously. Shortly afterward, Wyatt receives word that Ed Masterson has been killed, having shot and killed both his assailants before dying in the street. Wyatt returns to Dodge City to help bring law and order. After working there for a while, his family and he move to Tombstone, Arizona, under the protest of the Earp wives, and Mattie. Wyatt immediately finds himself at odds with the "Cowboy" gang. He meets and becomes romantically involved with Josie Marcus, which puts him at odds with her boyfriend, Sheriff Behan. This relationship also causes stress in his relationship with Mattie, and becomes the subject of rumor about town. Wyatt and his brothers Morgan and Virgil arrest several Cowboys, and Virgil takes over as marshal following the murder of town marshal Fred White. The brothers find themselves at odds with the Cowboys often, and tension builds. Wyatt breaks up several altercations involving the Cowboys, particularly Ike Clanton, and Doc Holliday swears his loyalty to Wyatt, whom he considers his only real friend. Eventually, the Gunfight at the O.K. Corral occurs, with the brothers becoming very unpopular in town. Virgil is ambushed and wounded, and Morgan is killed. The film then shows only a glimpse of the Vendetta Ride with Wyatt and his friends taking out revenge on the remaining Cowboys, and then skips to many years later with Josie and him mining for gold in Alaska. While en route by boat, a young man on the same boat recognizes Wyatt, and recounts a story in which Wyatt had saved the boy's uncle, "Tommy Behind-The-Deuce". Wyatt says to Josie, "Some people say it didn't happen that way", to which she responds "Never mind them, Wyatt. It happened that way." An epilogue states that Doc Holliday died six years later in a hospital in Glenwood Springs, Colorado. Members of the Clanton gang continued to die mysteriously for years after Morgan's murder. Josie and Wyatt's marriage lasted 47 years until Wyatt died at age 80 in Los Angeles. Costner was originally involved with the film Tombstone, another film about Wyatt Earp, written by Kevin Jarre of Glory fame. 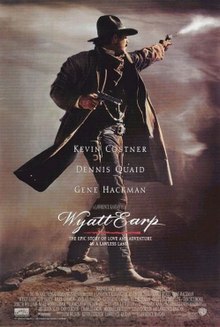 However, Costner disagreed with Jarre over the focus of the film (he believed that the emphasis should have been on Wyatt Earp rather than the many characters in Jarre's script) and left the project, eventually teaming up with Kasdan to produce his own Wyatt Earp project. The film was also originally meant to be a six-hour miniseries until Kevin Costner joined the cast. Costner proceeded to use his then-considerable clout to convince most of the major studios to refuse to distribute the competing film, which affected casting on the rival project. The score was composed by James Newton Howard, conducted by Marty Paich with The Hollywood Recording Musicians Orchestra and released by Warner Bros. Records in 1994. It was later re-released in 2013 by La-La Land. Wyatt Earp, released six months after Tombstone, was the less successful of the two films, taking in $25 million on a $63 million budget, compared to Tombstone's $56 million domestic gross on a $25 million budget. The film did debut at No. 4 at the box office, however. Wyatt Earp received mixed reviews. Review aggregate Rotten Tomatoes gave the film a "rotten" score of 42%, based on reviews from 26 critics, with an average rating of 5.3/10. Roger Ebert of the Chicago Sun-Times gave the film 2 out of 4 stars, saying "Wyatt Earp plays as if they took Tombstone and pumped it full of hot air. It involves many of the same characters and much of the same story, but little of the tension and drama. It's a rambling, unfocused biography of Wyatt Earp (Kevin Costner), starting when he's a kid and following his development from an awkward would-be lawyer into a slick gunslinger. This is a long journey, in a three-hour film that needs better pacing." Todd McCarthy of Variety praised the cast and production values, but remarked, "If you're going to ask an audience to sit through a three-hour, nine-minute rendition of an oft-told story, it would help to have a strong point of view on your material and an urgent reason to relate it. Such is not the case with Wyatt Earp." Similarly, Caryn James of The New York Times complimented the film's ambition and effort to portray a more human Wyatt, but still felt that 'the film's literal-minded approach to the hero's dark soul is one of its terrible problems. Wyatt Earp labors to turn this mythic figure into a complex man; instead it makes him a cardboard cutout and his story a creepingly slow one." Wyatt Earp was nominated for five Razzie Awards including Worst Picture, Worst Director and Worst Screen Couple (Costner and "any of his three wives"), winning two for Worst Remake or Sequel and Worst Actor (Costner). However, it was also nominated for an Academy Award for Best Cinematography in 1995 and writers Dan Gordon and Lawrence Kasdan received the Spur Award from the Western Writers of America for Best Drama Script. Tombstone - starring Kurt Russell as Wyatt Earp. My Darling Clementine – a 1946 Western, directed by John Ford, about the lead up to and battle of the OK Corral. Gunfight at the O.K. Corral – a 1957 Western, directed by John Sturges, about the same events. Hour of the Gun - a 1967 Western starring James Garner as Wyatt Earp. ^ "WYATT EARP (12)". British Board of Film Classification. July 11, 1994. Retrieved March 10, 2016. ^ "Fresh Ideas Pay Off at Box Office : Movies: Strong openings boost concept films such as 'Speed,' 'The Shadow' and other original ideas, while star vehicles stall". The Los Angeles Times. Retrieved January 12, 2011. ^ a b "Wyatt Earp". Box Office Mojo. IMDB. ^ "HOLLYWOOD HABITS : Leave 'Wyatt Earp' Off His Tombstone : Movies: Scripter Dan Gordon wants critics to know that the film is different from what he and Kevin Costner wrote and from his book". The Los Angeles Times. Retrieved December 5, 2010. ^ Beck, Henry Cabot. "The "Western" Godfather". True West Magazine. October 2006. ^ "Wyatt Earp (James Newton Howard)". Filmtracks. Retrieved November 16, 2016. ^ "Tombstone". Box Office Mojo. IMDb. ^ "Weekend Box Office". The Los Angeles Times. Retrieved January 12, 2011. ^ "Wyatt Earp". Rotten Tomatoes. Fandango. Retrieved November 9, 2017. ^ Ebert, Roger (June 24, 1994). "Wyatt Earp Movie Review & Film Summary (1994)". RogerEbert.com. Retrieved November 16, 2016. ^ McCarthy, Todd (June 20, 1994). "Wyatt Earp". Variety. Penske Business Media, LLC. Retrieved November 16, 2016. ^ James, Caryn (June 24, 1994). "Review/Film: Wyatt Earp; Into the Heart And Soul Of Darkness". NYTimes.com. The New York Times Company. Archived from the original on November 21, 2015. Retrieved November 16, 2016. This page was last edited on 24 February 2019, at 19:59 (UTC).